94.1 KODJ and JBR Clinical Research invite you to join us at the Bank of American Fork Stadium of Fire. One of the world's biggest entertainers is set to headline one of America's biggest Independence Day celebrations. The newly crowned 2018 CMA Entertainer of the Year Keith Urban will perform for the first time ever at Stadium of Fire in Provo, Utah on July 4th, 2019. Keith Urban will be joined by “Flippenout” trampoline team, skydivers, a military flyover & the USA’s biggest stadium fireworks show. Tickets to Stadium of Fire are on sale now at www.stadiumoffire.com and at the BYU Marriott Center ticket office in Provo. The four-time Grammy Award-winner Keith Urban released Graffiti U in 2018, which debuted #1 on charts in the United States, Canada and Australia. This is Urban’s ninth studio recording and follows one of the most successful releases of his career, 2016’s RIPCORD. 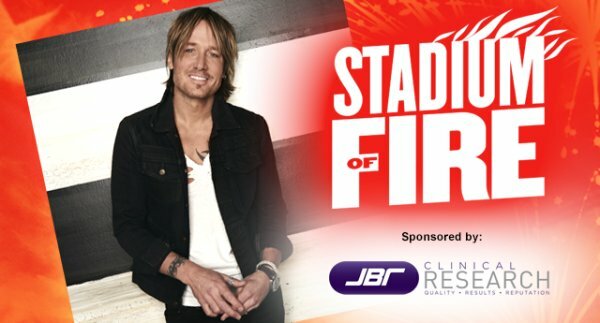 Win Tickets to Stadium of Fire! Score your tickets from 94.1 KODJ and JBR Clinical Research.